Super Mom! 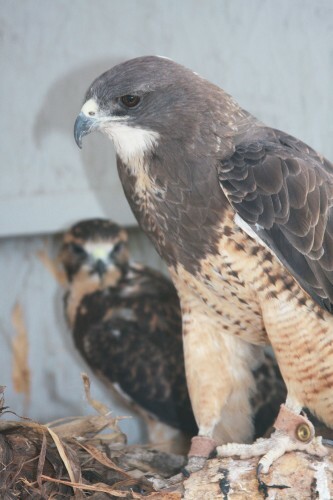 /Hawks Aloft Inc.
Our educational Swainson’s Hawk, Hudder is the world’s best foster mother! Every year she builds a nest and lays two infertile eggs. And she sits patiently on them until Gail removes them about 2 months later, just KNOWING that chicks will come. Once the eggs are gone, she wails because there are no babies. But, some years she gets to be a foster mother, and she is the best mom ever! 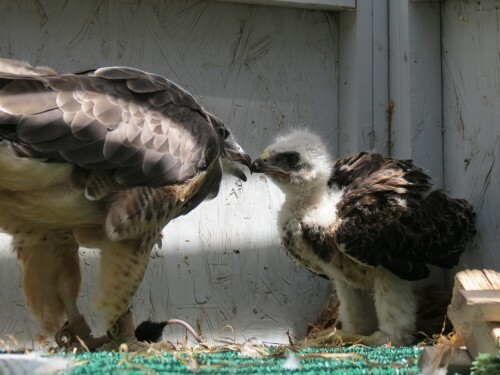 This year, she fostered three Swainson’s Hawks chicks. All three came to Hawks Aloft from The Santa Fe Raptor Center. They were found in southern New Mexico. All were orphans, probably victims of the drought. Nest failure has been high this year and it’s believed to be because of the drought. Prey numbers of all types are down, including grasshoppers and small mammals favored by Swainson’s Hawks. Hudder started to care for chick #1 from almost the first minute that he was placed in her flight cage. She fed him 5 mice for his first meal. He was hungry! She was hyper vigilant in watching over his safety and making sure he ate well. Chicks # 2 and 3 came to Hudder later in July. She was just as good a foster mother with them. Chick #2 had a problem with a cloudy eye, so his human foster parents watched him closely too. Chick #3 was able to self feed from the beginning, swallowing mice whole, but Hudder tried to help feed him anyway. All three chicks became part of the family group. Now that the chicks are older, they are back in Santa Fe attending mouse school. They seem to be doing very well, even chick #2 is learning to hunt for himself. We hope they will be released this fall in southern New Mexico. Hudder was rescued herself in 1989, making her 24 years old, our oldest educational ambassador. We don’t know much about what happened to her before she arrived here. Likely, she may have been hit by a car. Her left pupil is fixed and her right wing is damaged. But that doesn’t stop her from being a Super Mom and a great educational bird too.